We can talk openly, right? You’ll probably lose a lot of sleep on Christmas Eve waiting to hear the prancing and pawing of Santa’s reindeer on your roof. This obviously means you’re going to be too exhausted to cook a huge Christmas Day feast. Give yourself the gift of relaxation by hitting up one of these San Francisco restaurants, all open on Christmas. Some are offering fancy, multi-course, prix fixe meals you should call ahead for, and some are just a great place to stop in and get delicious dumplings. If dim sum on Christmas Day sounds delicious, then head to Yank sing between 10am and 4pm. 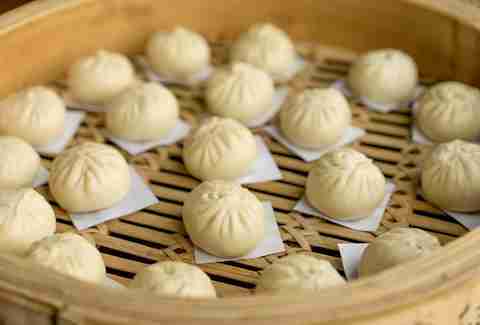 The popular restaurant will be serving its full menu, including the signature peking duck and pork xiao long bao. This old-school SF restaurant will be open from noon to close on Christmas Day with a limited menu (yet to be determined) and lots of boozy beverages. 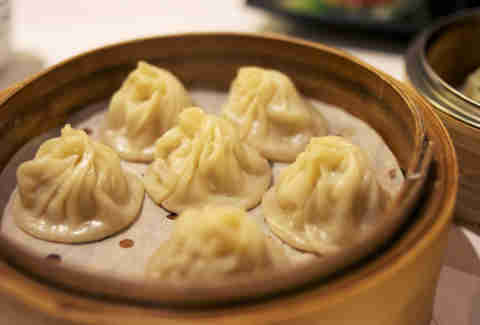 If you’re thinking of skipping the traditional Christmas meal or just need a tasty snack, Dumpling Time will be open for lunch and dinner serving its usual menu of gyoza, bao, siu mai, noodles, and xiao long bao. It’s not Christmas in SF without Dungeness crab, and you can get your fix at Fog Harbor. 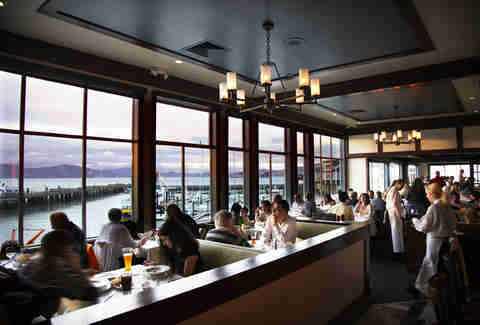 Sure, it’s on Pier 39, but the views of the bay make up for the tourists. 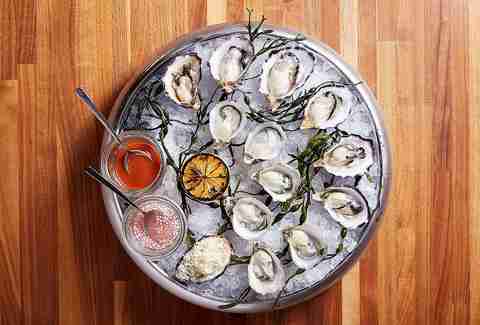 There will be a special Dungeness crab-focused holiday a la carte menu, as well as the regular seafood-heavy menu. Fog Harbor is open from 11am to 9pm. 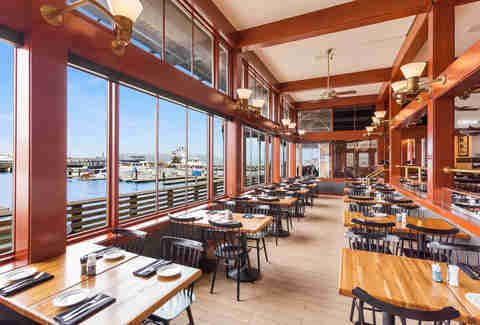 This Pier 39 seafood restaurant will have a Dungeness crab-focused holiday menu and will also be serving the full regular menu that focuses on mesquite-grilled seafood and meats. The restaurant has great views of the water and will be open from 11am to 9pm. The (almost) waterfront restaurant across from the Ferry Building is offering a three-course, prix fixe menu on Christmas Day with dishes like burrata with grilled persimmon and pistachio pesto, crispy pork belly, half a Dungeness crab, butternut squash ravioli, prime rib, flourless chocolate cake with eggnog ice cream, and a cranberry brown butter tart with white chocolate whipped cream. Seatings are between 2pm and 3pm, 4pm and 5pm, and 6pm and 7pm. 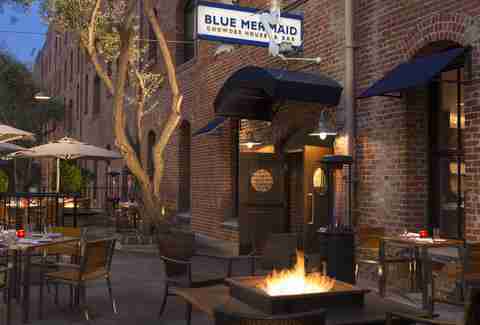 The best seats to enjoy the Blue Mermaid’s three-course, Christmas Day prix fixe menu are on the heated patio. For your appetizer, choose from pan-seared bay scallops or a port poached Warren pear salad. The main course is a choice of herb-crusted prime rib and pan-seared Alaskan halibut with local Dungeness crab gratin. Dessert is a Yule log (chocolate cake with vanilla frosting) or assorted petit fours and Christmas cookies. Hours are 5pm to 10pm. 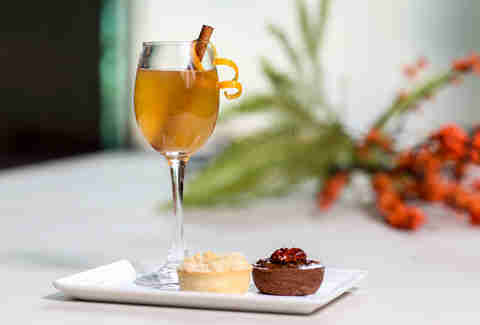 The British-inspired brasserie is offering a four-course, prix fixe menu on Christmas Day with a selection of options, including wild mushroom soup, Dungeness crab and bay shrimp salad, prime rib of beef, heritage ham, lemon raspberry trifle, and pecan bars. If you want great service, an elegant setting, and a satisfying menu, make a Christmas Day reservation at The Grill. The five-course menu will include dishes like butternut squash velouté, duck prosciutto with feta cheese and spice-rubbed pita chips, pan-roasted Alaskan halibut, butternut squash purée, prime rib-eye, and a chocolate and raspberry Yule log. Dinner will be served from 4:30pm to 9:30pm. 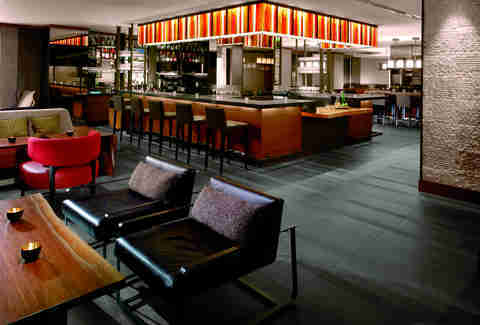 The Michelin-starred restaurant will have a holiday buffet for brunch and a three-course, prix fixe menu for dinner. Brunch will include dim sum, an omelet station, and unlimited bubbly, while the three-course dinner is yet to be determined (but will surely be delicious). 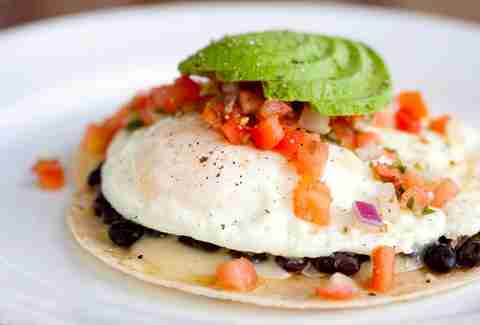 Brunch is available from 11am to 2:30pm. Dinner is from 5pm to 9pm. 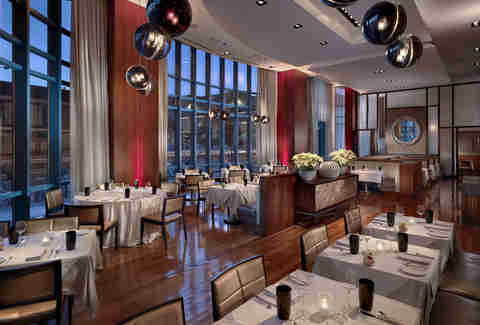 This restaurant inside of the Four Seasons is offering a four-course, prix fixe feast on Christmas Day. 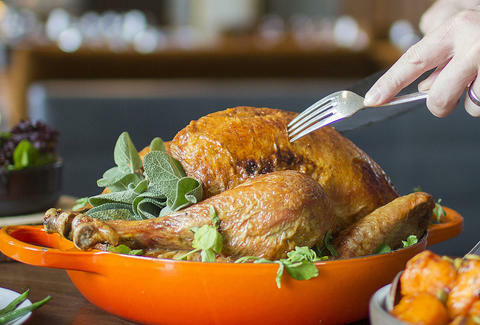 Dishes will include a butternut squash soup with crispy burrata, fried sage, and brown butter, Flannery beef filet, Willie Bird organic turkey, and ricotta gnudi with wild mushroom and spinach. There will also be Yukon potato purée and green bean casserole for the table to share, as well as a trio of family-style desserts: chestnut crepe cake, Santa hat strawberry cheesecake, and peppermint chocolate bark. The hours are noon to 8pm. The elegant, fine dining restaurant inside the Ritz-Carlton is offering a special four-course, prix fixe menu on Christmas Day. Dishes include celery root soup with black truffle and pomegranate, pan-seared sea scallops with poached lobster dumplings, roasted Liberty Farm duck with parsnip purée, and a gingerbread roll with spiced pear and cranberry sauce. Seatings are available from 11am to 8:30pm. 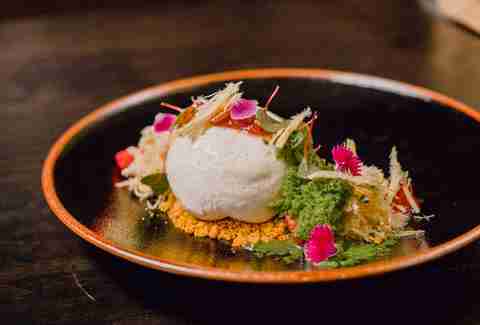 The Michelin-starred restaurant will forgo its popular tasting menu in favor of a five-course, prix fixe menu showcasing dishes that put a holiday spin on the restaurant’s signature Cal-Indian cuisine. The meal starts with oysters and caviar and is then followed by a choice of Maine lobster in a spiced coconut broth or heirloom beets with grilled apples. 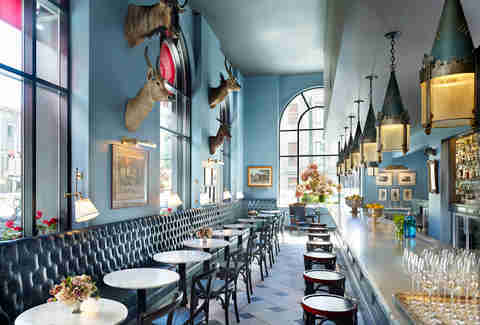 Diners will then move to a sunchoke velouté, a choice of black bass or angus beef rib-eye, and will end with a choice of tandoori pineapple with smoked coconut ice cream or dark chocolate with chestnut, cocoa nib, sorrel, caramel, and gold. 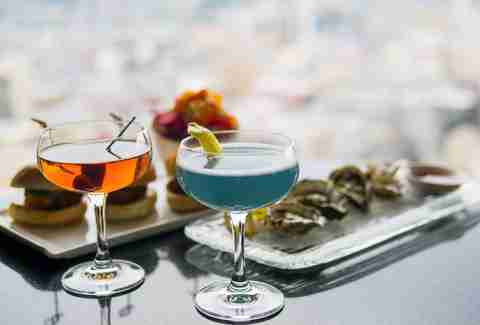 If you want your Christmas brunch or dinner with a side of stunning 360-degree city views, this iconic bar and restaurant at the InterContinental Mark Hopkins is the place to be. Christmas meals will both be indulgent buffets with more stations than you’ll be able to visit (yes, that’s a challenge). Brunch will have an omelet station, Belgian waffles, eggs Benedict, and more, while dinner will include traditional holiday roasts like prime rib or leg of lamb, alongside a selection of fresh seafood, pastas, and salads. There are seatings from 9:30am to 1pm and 3pm to 7pm. 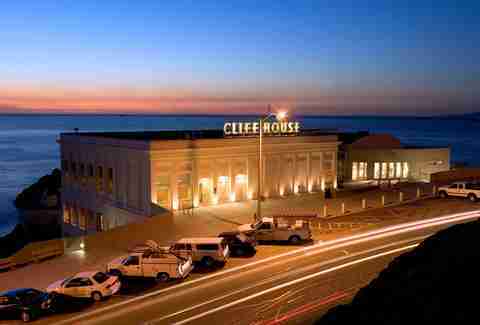 Enjoy views of the ocean and a special a la carte Christmas menu from 11am to 9:30pm. 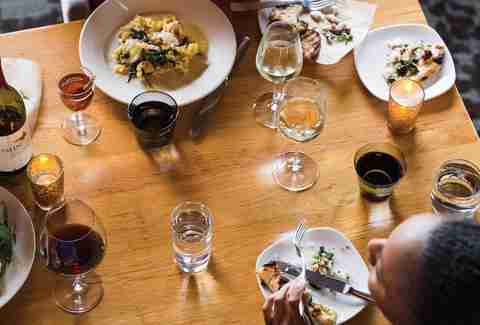 Dishes include Dungeness crab cakes, prime rib of beef, scallop, prawn, and clam paella, and roasted pork chop. Daisy Barringer is an SF-based freelance writer. On Christmas Day, you’ll be able to find her on the slopes of Alpine Meadows. Follow her on Twitter @daisy.